For such an exotic, far-flung trip to central Africa, there isn't a whole lot I need to do in terms of preparing for my Rwandan adventure. After backpacking for 15 straight months, and always being on the go, the process has become like second nature to me. I know what I will pack, and how I will pack it. I know there are a few toiletries and miscellaneous items I'll want to pick up, but there's no rush, and none of it is critical. I could be asked to leave tomorrow morning and I'd chuck my stuff in the ‘ole backpack and know I'd have a great time of it. After buying the cheapest plane ticket I could find, ensuring my immunizations were up-to-date for that region was the next most important thing I could come up with. I Google'd “CDC Rwanda” and the first result was the recommendations by the US Centers for Disease Control and Prevention. As a result of all the shots I got before my 'round the world trip back in Fall 2007, I only needed to re-up my Typhoid. The oral vaccine lasts 5 years, and I had gotten it the first time for my trip to Costa Rica in 2005. The Rabies vaccine is expensive, and even if you're bitten by a rabid animal, you still need to get shots. Instead, I intend to keep a safe distance from all primates, bats, and miscellaneous mammals I come across. All of the following antimalarial drugs are equal options for preventing malaria in Rwanda: Atovaquone/proguanil, doxycycline, or mefloquine. Thankfully, my drug of choice, doxycycline, is an option for Rwanda. No side effects to-date, and since I don't have prescription drug coverage, the inexpensive cost is also a factor for me. 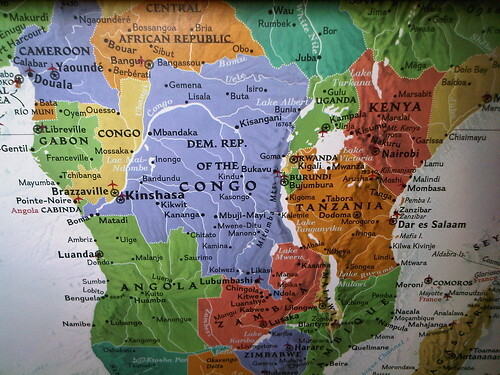 I made an appointment with a county-run travel clinic, and when I met the nurse who took my info, and said I was going to Rwanda, she responded “where is that?” I got up and pointed to what seemed like the tiniest country in Africa on the same National Geographic map that I use to have hanging on my apartment wall for years. Her response was something along the lines of that being a region of the world where all the diseases come from. Her chat about food and water safety was all a formality, nothing I wasn't already aware of, though I suppose it's good to have a reminder from time to time – keep oneself in check and all. Then the doctor came in and gave me the little box of live Typhoid vaccine, which requires refrigeration, and a doxy prescription. The Doxycycline is my Malaria drug of choice. You have to take it daily, but it's the least expensive, and side effects, if any, are minor compared to the other options. A friend of mine had previously written about going to a public health clinic where he could get some shots for free, possibly the Hepatitis ones, so that's definitely worth looking into since it can be so costly. I've only met one person who got the Rabies vaccine, and she was going to be spending 6 months in India (where dogs are scary!). i hate thinking about malarial meds. just finished our dose for central america (honestly think we could have done without it)… and now we have to pick some up for kruger. i already have sensitive skin and am worried about the whole sun sensitivity issue. I prefer the once-weekly Mefloquine. I didn't get any wicked dreams they said I would but I did get this awesome deja vu feeling though. No side effects to-date, and since I don’t have prescription drug coverage, the inexpensive cost is also a factor for me.